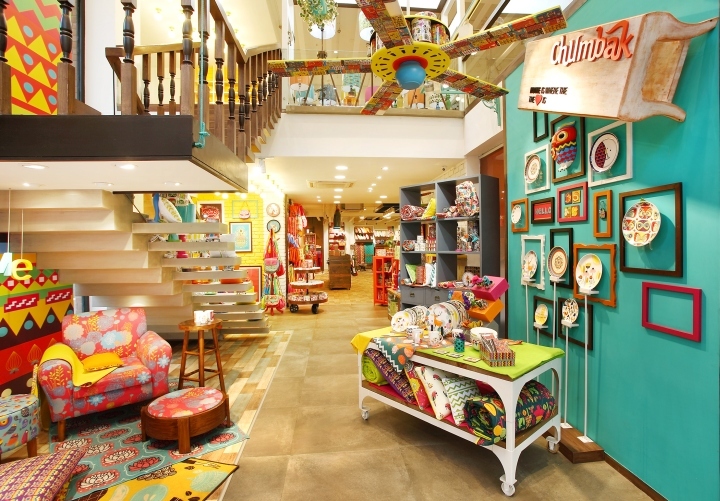 Chumbak stores itself looks so lively, then why not we have a look into its lovely, colorful décor items. Here are some of the beautiful and interesting designer items from Chumbak which you will love to have at your home. 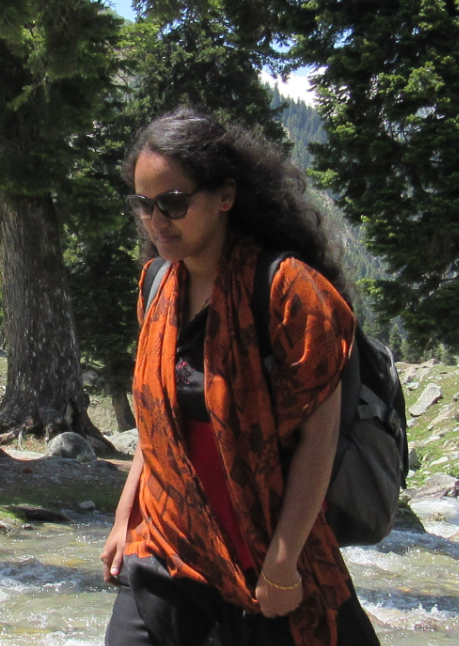 Unlike others, Chumbak has some unique and different products to introduce. It sticks to its own colors and combination which makes it distinct. Trunks and Boxes – Colorful Geometric Tissue Box, Home Is Where the Heart Is Suitcase and The Sweet Tooth Box are some of the attractive names given to these box. The Suitcase look so vintage and you will have a feel that it is the right place you can store all your old memory items. Bathware – I just loved the Owl Bath Rug and the Bathware Set. The rug is also in the design of fox but the owl looks cuter. You can have these bath set in different colors like minty, yellow and blue. 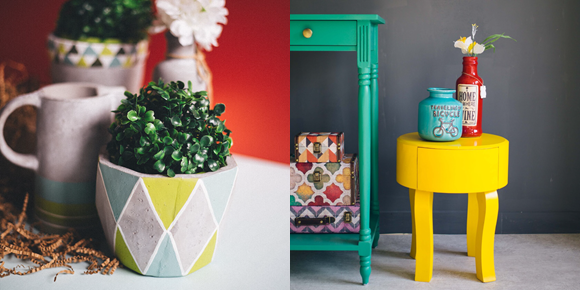 Planters – Planters who love Chumbak design can benefit from these pots and pitchers. You can also make flower arrangement fun with this pretty Pitcher Vase. It has its own peppy colors which makes all Chumbak products so unique. Furniture – When I checked Furniture from Chumbak, my eyes went directly to the Pouffes especially the Flower Burst Pouffe which is ideal for living rooms, bedrooms, foyers and dens. Its floral pattern will attract us accompanied with its warm and soft nature. Wall Décor – When it comes to Wall Décor, Chumbak has its own uniqueness. I just felt like picking everything. Most of the wall art are those scenes we see in our daily life but still we simply love it because of the way it has featured. You can surely get a right shade for your wall. I really love the baby colors and cartoony pictures of wall clocks. Lighting – This Pretty Little Bird Candleholder is right choice for candlelight dinners. You can get these small beautiful bird light house in almost all shades of colors. You can have it outdoors and it will look celebrated when you lit up during dark. Dining – Chumbak have a wide variety for dining. I liked their Brunch Mason Jar Set which comes with 4 pieces each with different shades of colors. Crockery from Chumbak is so beautiful that it will be difficult for us to choose a right one. Bed Linen – Getting a customized bedroom is everyone’s dream and Chumbak is sure to fulfill that with these set of colorful cushion covers and bed cover. You can get into other accessories they have used to décor the bedroom with matching table, clock, wall art and much more. 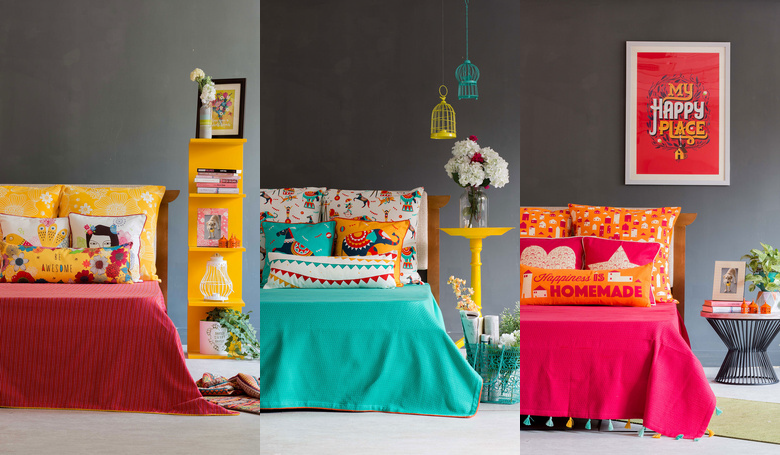 Decorate your home with these Chumbak collections and make your space livelier. You can check out its home décor items at Chumbak Online Store. Also If you have a very unique item at your home like Chumbak, please take a click and send it to us so that we can include it here.